Is this CNLight HID Bulb faulty? 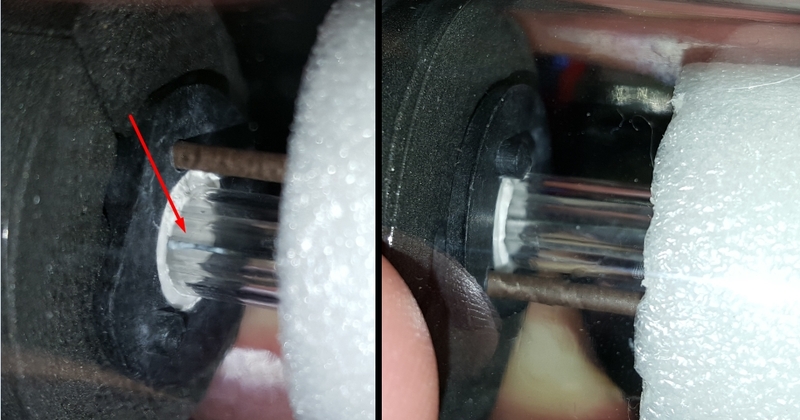 I received a couple of H1 6000K CNLight HID bulbs but I noticed that one of them had plenty of white marks on the top of its glass and also on the bottom of the "internal electrode". Is this normal or there's something faulty with it? The other is pretty much free of spots. Take a look at the pictures below with both of the bulbs side by side. Does it work? If so, then what's the problem? They're cheap bulbs, who cares if they didn't cut the glass properly or glued the base on messily. The top being partially broken is fine, bottom I can't tell. Fire it up and see what happens lol. Alright, thanks for the help. I'm also waiting for some CNLight Ball Bulbs to arrive. CNLight are fine bulbs. Perform decently. My experience is...yes they produce light, but that was about it. The focus was poor and the color temp was not quite as indicated either and the life span was comically short compared to OEM. For what used OEM bulbs go for or even just new standard OEM bulbs go for you'll be a lot happier. The CNLights in my MR2 were just as bright as Morimotos with a better color temp. A bit cooler than advertised but no tint or ugliness. Focus was good side to side. Lifespan not so good, one started flickering after 4 years. Then the flicker went away. Still fairly bright, but not OEM lifespan. But also cost like $20. Great bulbs for the price. Not cheap garbage. Which other options are better? (for H1 6000K). Also CNLights sell for 15$ now or less, at least in aliexpress. By the way, I replaced my crappy 20$ generic HID Kit with Hylux A2088 Ballasts + CNLight 6000K H1 (straight bulbs) and I notice a slight color difference and bit random light shake (sometimes from left and some from right side) at further parts of the beam from time to time (noticed that with car stopped either with engine on or off), any idea? Everything is brand new. Is there an issue?